Distance relying is considered for protection of transmission lines where the time-lag can not be permitted and selectivity can not be obtained by overcurrent relying. Distance protection is used for secondary lines and main lines. 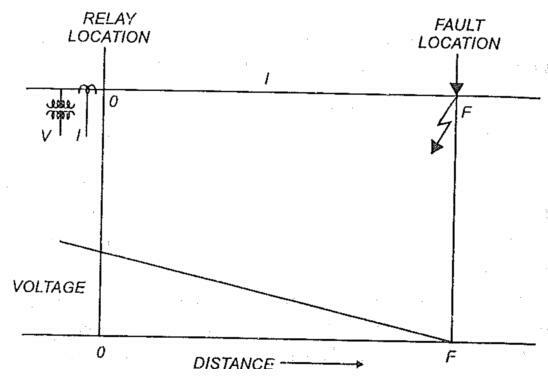 A distance relay measures the ratio V/I at relay location which gives the measure of distance between the relay and fault location. The impedance (resistance/reactance/admittance) of a fault loop is proportional to the distance between the relay location and the fault point. For a given setting, the distance relay picks up when impedance measured by it is less than the set value. Hence it protects a certain length of line. Hence it is called distance relay. Measurement. Considering zero fault impedance the voltage at fault point will be zero. The voltage at relay location O will be equal to the voltage drop along the path OF, whereas same current I is flowing in the line at O upto F. If fault had occurred near O, the voltage at O would be different. Current would be more because of the reduction in line impedance. If fault occurred away from O, the voltage at O would be lesser and current would also be lesser. In distance relays the ratio V/I is measured. 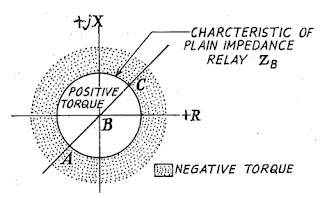 The current gives operating torque and voltage gives restraining torque. Hence for values of Z above certain setting the relay does not operate. Hence it protects only a certain length of line equivalent to its impedance setting. 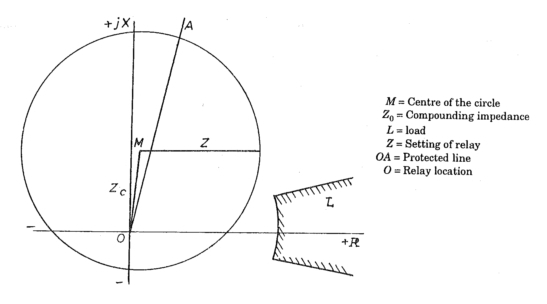 For the impedance measurement there several possibilities however, for distance protection equipment the impedance Z = V/I or the conductance G = (I / V) cosΦ are generally measured. When planing impedance-dependent protection schemes particular attention must be paid to the influence of the arc resistance on the loop impedance. This arc resistance has ohmic nature and increase the circuit impedance of the short-circuit loop. This falsifies the measurement of impedance by the protection equipment as regards both magnitude and phase relation. Allowance must be made for the effect of arc resistance when setting the protection equipment. The resulting tripping characteristics represent a modified value between the impedance and conductance measurement. Modern distance protection relays include provisions for matching the degree of arc compensation to the short circuit angle of the line depending on the application. 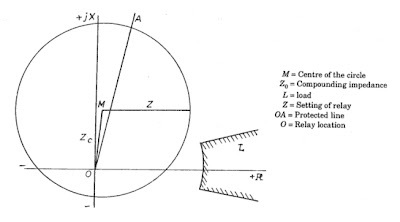 L = Length of arc in meters in open standstill air. I = Fault current Amperes. Due to the extra arc resistance the distance measured by the impedance relays is inaccurate. The distance relay will measure in impedance Zf + Rarc , where Zf is impedance of line. Foe short lines, the Zf is relatively low and Rarc is not negligible. 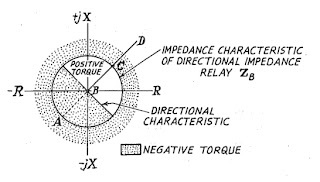 Hence measurement of impedance Z = Zf + Rarc does not give accurate measure of distance. For long lines, the Rarc is negligible compared with Z. 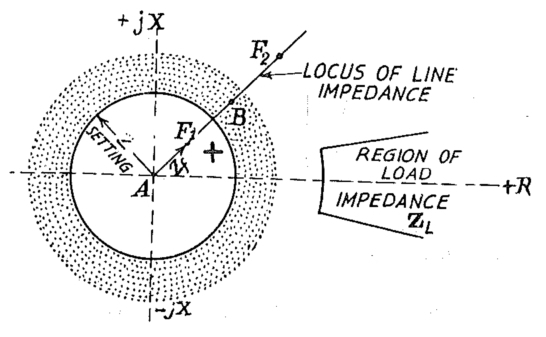 Hence measurement of impedance gives fairly accurate measurement of distance. A sudden change in loading condition in a power system causes power swing between load point and source. Under certain circumstances, the power swings can cause the operation of distance relays. Hence it is desirable to examine the behaviour of distance relays during power swings. The application of such relay in practical distance schemes are discussed in this chapter. There is no hard and fast rule regarding these applications. There is overlapping in many areas of applications. Fig. 2, the plain impedance relay does not recognize the direction in which the fault has occurred. Relay is Non-Directional. Hence it will operate for all faults along the line BC and also along BA provided the impedance measured by relay ZB is less than the setting. The relay unit can be high speed (instantaneous) or with time increasing with measured impedance. The relay will not only operate for faults on section BC but als o faults in section AB and faults on busbar in station B. Therefor, discrimination between faults on neighbouring sections is not possible with plain impedance protection. - Selectivity can not be obtained as it operates for faults on either sides. Circle covers all four sectors. - As it measures resistance and reactance, it is affected by resistance of arc, resistance of transmission line. - It is affected by power swings (fluctuation of reactive power) as the circular characteristic covers a large area on every side of centre wing point comes within circle. Ref. to Fig. 2 for faults near C, in the line BC, the relay at B can not accurately discriminate between fault in CD and fault in BC. The fault resistance will be seen by relays as extension of line length, thereby the relay set for protecting line BC will not operate for faults very near C. This is called under reach. 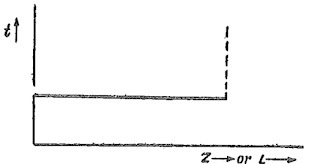 Fault resistance is a horizontal line segment on R-X diagram (Fig. 7). For a fault near C (Fig. 3), such segment will take measure point beyond the circle. Therefor the relay will under reach. It is a standard practice to set the reach of the first zone of distance relay to cover only about 85% of protected line impedance (Ref. Fig.4). For achieving discrimination between forward and real faults, the directional impedance relays are used. Directional impedance protection acts only for faults in forward direction. This is explained in Fig. 5. The directional impedance relay ZB does not operate for faults in zone BA and for faults on busbar B.
Directional impedance Relay combines the directional element and impedance measuring element in a single case. The voltage supplied to the directional element is taken from the two phases from which current is not taken. Thereby the function of directional element is not affected by drop of voltage. Directional Impedance Relays are preferred for phase fault protection of lines of moderates lengths. 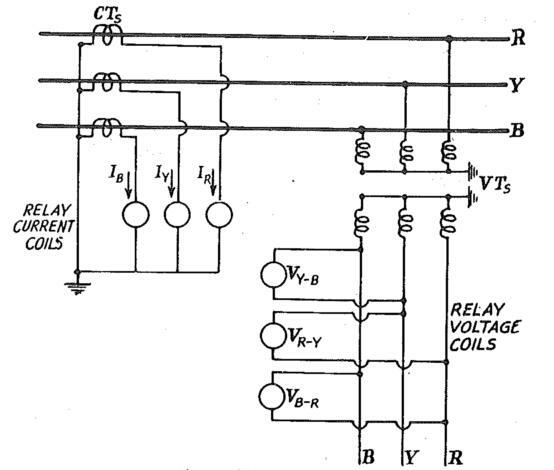 The main advantage of reactance relay is that is not affected by fault resistance. 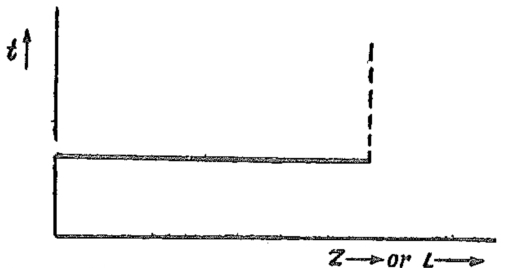 The characteristic of plain reactance relay is a line parallel to R-axis in R-X plane. However, the reactance relay is not used by itself. It is generally used along with Mho Relay or offset Mho Relay. Suppose recatance relay is used along with Mho Starting Relay (Fig. 6). The reactance relay measures reactance upto fault point. The voltage drop due to arc (AB) does not affect the measurement, as all points on AB are in operating region. Hence such relays are used for protection of short lines having fault currents less than 20 KA. In such lines the effect of fault resistance is predominant. In case of long lines, the effect of arc resistance is negligible. Mho characteristic is a circle passing through origin of R-X diagram (Fig. 6) Mho relay preferred for phase fault relaying of long lines particularly where severe synchronizing power surges can occur. (Fig 8). Fig. 8 Comparison of Mho characteristic and impedance characteristic under conditions of Reactive Power swings. 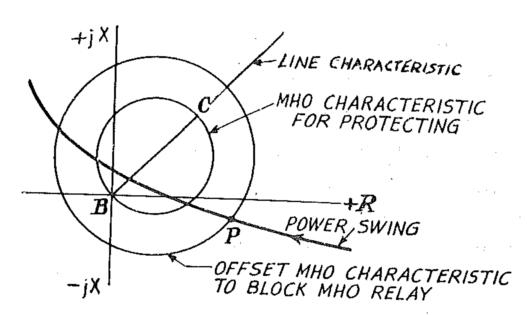 Comparing to impedance characteristic (for protecting line AB), the Mho characteristic requires very much less area. Hence many points covered by impedance characteristic are in the negative torque region of Mho characteristic (Figs . 8 and 9). Hence Mho relay can remain inoperative during power swings on EHV lines to a greater extent than impedance relay. Referring to Fig. 9 the Mho characteristic at B1 is offset so as to enclose origin B and cover the busbar zone at B. 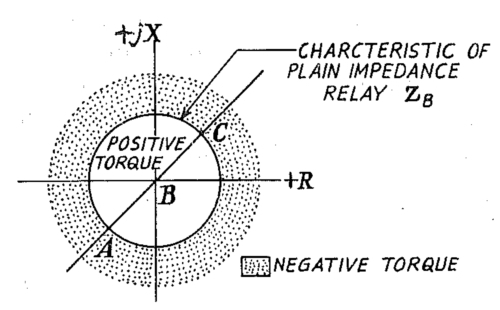 (Hatched Area indicates that impedance characteristic has much more of +ve torque region which is beyond that of Mho characteristic). Referring to Fig. 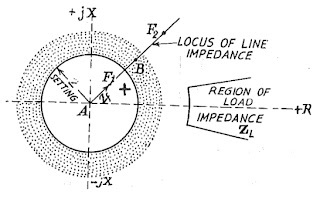 10 during the power swing locus of impedance measured by relay moves along the curve. 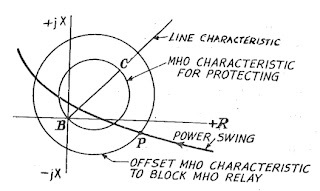 As soon as it comes within the positive torque region of the offset Mho characteristic (point P, the offset Mho relay acts and blocks the measuring relay for line BC. Therefor, the relay does not operate during power swing . Fig. 10 Blocking during power swings. - speed of operation desired. - other protections provided for line. - whether high speed auto-reclosure provided. 1. Distance schemes designed for phase fault only. 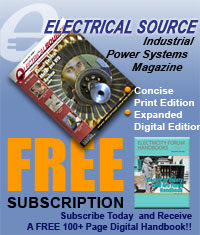 Ground fault protection provided by overcurrent relays. 2. Non-switched schemes for phase faults as well as earth faults. Such schemes have separate distance relays for phase faults and earth faults. Thus such schemes have several measuring elements. 3. Switched schemes having a single set of measuring element (for all kinds of faults) to which an appropriate measured quantity is applied according to type of fault. - zone timer - tripping relays. - To switch the measuring element to correct input quantity, depending upon type of faults, in case of distance relay with single measuring element. - Selecting of correct phase for tripping instruction, if single phase auto reclosure is used. - To give non-directional back up to measuring elements. - To prepare carrier equipment to receive a possible instruction. The starting element also called fault detector acts first and switches the measuring element to appropriate input quantity. In switched schemes, there is only a single measuring element which is switches to appropriate phase by starting element and their auxiliaries, depending upon the type of fault. The choice of scheme is made from standard schemes (examples in Table 1). In non-switched schemes, for each type of fault there is separate measuring element. - Impedance Starters - Minimum Impedance type. In the event of a fault the starting elements will operate first and apply the secondary voltage and current of the faulty phase or phase to the measuring element. For the majority of applications overcurrent starting will be adequate, but where required, for example in a resistance earthed system, undervoltage starting can be added. When impedance staring is required (see above) the overcurrent and undervoltage elements are replaced by the impedance starting-elements. These are normally connected to select correctly the faulty phase in the case of phase fault. In the case of an earth fault, the connections of the three impedance starting-element are switched by means of the residual current starting element to select correctly the faulty phase. As starting element of distance relay in e.h.v. system minimum-impedance relays are preferred because the minimum short-circuit current in such system at low loads is often less than the maximum service current at peak load. The minimum impedance relay compares the voltage and the current ; its functional principle being described in Fig. 11 and 12. For the protection of long and/of heavily loaded ones, the voltage applied to minimum impedance relays can be compounded to enable the starting elements to earth further along the line. At the same time a much heavier load can be carried without the starting elements picking up. The distance relays early day used to have Inverse characteristic vs. Time. Now such characteristic is no more preferred and distance relays have stepped characteristic. The stepped characteristic may be either single stepped (Fig. 13) or three stepped, (Fig. 14). Single step distance relay can be used where high set instantaneous overcurrent relays can not be used. The typical applications of single-step distance protection are protection for transformer feeder, protection of single section transmission lines, protection of bus bars etc. The conventional distance measuring element has instantaneous time-distance characteristics. The operating time becomes infinite at relay reach point. The distance relay is set for a value say Z corresponding to length of line L. Then if a fault occurs within length L, the ideal distance relay operate instantaneously. However the d.c. component of wave. fault resistance, influence the relay measurement and cause over-reach or under reach. Over-reach. When short circuit occurs, the current wave has d.c. component which causes a distance relay to over-reach, i.e. to operate for a large impedance than desired. The tendency to over-reach is minimized by adjusting the voltage to 90 to 80% of its normal value. Due to the extra arc resistance the distance measured by impedance relays inaccurate. The distance relay will measure an impedance Zf + Rarc where Zf is the impedance of line. 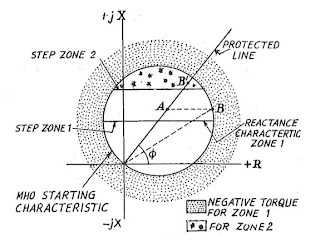 By adding Zf and Rarc the measured point on R-X diagram goes out of impedance circle and relay does not operate even though the fault in within the protection zone. This is called Under reach. Fig. 13 Single-step characteristic of high speed impedance relay : above certain Z, the relay is inoperative. For smallest Z the relay operates in time. The transmission lines having successive line section can be protected by means of three-zone distance protection schemes. By such schemes, quick protection can be obtained and back up of the sections as well as adjoining lines/bus bars can also be provided. - Switching resistance in relay restraint circuit at per-set time intervals by means of time element. - Separate measuring element for zone 2 and zone 3. 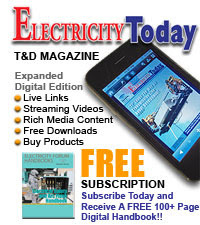 Sudden change in load condition in the system cause power swings between the and generating station. The starting elements (SE) in distance scheme generally responds to power swings. Overcurrent SE is readily affected. During power swings, there is a heavy flow of equalization current in transmission lines, current caused by swing flow equally in all phases causing the overcurrent SE to pick up in all phases. Minimum impedance SE responds to ratio V/I during power swing, voltage also drops at certain points of the system in addition of equalizing currents. Therefor, such starting relay of all three phases can pick up during heavy power swing. Hence the measuring element (ME) has to decide whether to operate the relay or to block it. In general distance relays having mho characteristic are less susceptible to power swings because their narrow characteristic. Generally during power swings an out-of-step blocking relay operates. If measuring element operates within a certain time after operation of blocking relay, then tripping is allowed. Modern distance relays are stable lover a wide range of power swings, they do not trip unselectivity, if power swing reverts to normal condition fairly soon. If the condition prevails, the relay trips. 7. Carrier Assisted Distance Protection. - Simultaneous opening of circuit breakers at both ends of the line for internal faults. - Discrimination between internal and external faults. - Independent phase relaying, etc. - Distance relays are used in conjunction with carrier channel. Carrier signal is transmitted to the other end of the section to bring about simultaneous tripping of the line section. This is called Transfer trip or Intertrip technique. After the tripping, the auto-reclosure relays takes over. With stepped time-distance characteristics of distance relays, the first distance step (RA) is generally to cover about 80 per cent of first line section. The relay at remote end (RB) is arranged in a similar way, but in opposite direction (Fig. 15). Carrier transfer is explained by means of Fig. 15. If fault occurs in the middle of the section, the distance relays at both end (RA and RB) will trip with time t1 of the first step. However, if the faults occurs near the end of the line section, (say F2 near RA), the relay at P remote end (RB) will operate with time t2 whereas relay at local end (RA) will operate with time t1 resulting in nonsimultaneous operating of circuit breakers at both the ends. This is not desirable from stability and auto-reclosure considerations. The near relay (RA in this case) is therefor, made to send a carrier signal to the remote end (RB) to bring about simultaneous tripping of the circuit breakers at both ends. After operation of the relays and circuit breakers, auto-reclosure relay takes over. The scheme for carrier transfer is illustrated in Fig.16. The relay step 1-circuit initiates the transmission signal sent by the carrier transmitter via the line Fig. 16(b). The step 1 relay S1 initiates the carrier transfer in addition to completion of the trip circuit at local end. A similar set arrangement are provided the remote end. In this case the distance step is arranged to over-reach. Provision is made to prevent the tripping of the circuit breakers for faults on next section. The principle is as follows : "The direction of fault power at two ends of the protected line is compared by means of directional relays. Under internal fault conditions the direction of the fault power must be outwards at one end and inwards at the other end. Under through fault condition the fault must be fed into the line at only one end Fig. 17. The primary protection is given by distance relays. The directional comparison relaying operates in conjunction with the distance relays. When fault power is flowing outward from the line at one end, the directional relay at that end actuates a carrier signals which block at its local end and at the other end. Suppose fault occurs in adjacent line BC. The directional relay at B1 will actuate and it will send signal to station A. Thereby the tripping of CB's at A1 and B1 is blocked. If short circuit occurs in the section AB no signal is sent to block tripping A2 and B1. Thus carrier signal is sent only during fault conditions. Depending upon the kind of distance relay, various circuit arrangements may be used. During fault on BC very near to B2, the distance relay at A2 will start as it is set with an over-reach of about 20% over the length AB. However, a time delay is provided such that a relay at the A2 does not operate earlier than receiving blocking signal. If no blocking signal is received, the fault is internal for zone AB and relay at A2 operates. Thus carrier blocking schemes should have a slight time delay for their first step. By using first blocking signals, this time delay can be cut down. Carrier Blocking schemes have an advantage that the signal is transferred over healthy line. In this scheme, a signal received from a relay at opposite end is used to extend the first step from about 80% to about 150% of the reach (length of the protected line) by shunting the timer element of zone 2. The contacts of timer of zone 2 relay are shunted by normally open carrier receiver relay contacts. Thus all faults within protected section can be cleared approximately at the time of first zone. Fig. 18 explains this principle. For faults near B, in section AB, a carrier signal is sent from section B to station A is accelerated and the second step timer is shunted. Thereby the second zone time is reduced from tA2 to tA1. A similar characteristic (not shown) is provided at B in direction BA. Distance relay can be arranged in conjunction with single phase or three phase auto-reclosure. In case of switched schemes, the pole selection is made by starting element auxiliaries. In non switched schemes, it is provided by respective phase measuring elements and their auxiliary element. However all the three measuring elements may be tripped to ensure whether the fault is on more than one phase. Distance relays are connected in the secondary circuit of CT's and VT's. 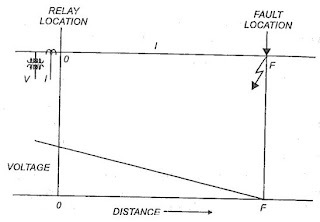 The connection should such that the impedance measured by the relay should be proportional to the distance between relay location and the fault, for all types of faults. Fig 19 Connection for distance relay for phase faults. The voltage supplied to relay coil (Vr) must be proportional to the voltage drop upto fault point. The current supplied to relay coil (Ir) should be proportional to fault current. To achieve this, the distance relays should be connected such that they cover the fault loop. - Double phase to earth fault. 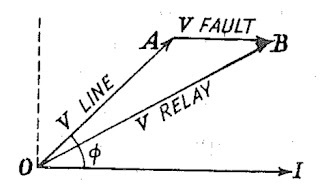 Phase to phase fault can occur between R-Y, Y-B, B-R. To cover these faults, distance relay should have three measuring elements (in one casing). Alternatively, a single measuring element switched over to appropriate voltage and current. Fig. 19 illustrates a typical connection for phase fault protection. In this scheme there are three measuring elements. The current coils are connected in star to three secondaries of line CT's. The voltage coils are connected in delta across secondaries of line VT's. Connection for distance Earth fault relay (Not shown) are different from the distance phase fault relays. For protection of transmission lines usually distance protections are used, the principle of operation of these relays as explained earlier depends on the fact that under fault conditions the ratio of voltage to current remains constant and is independent of the fault current and its power factor.